Traffic in Juba Town has returned to its normal shambolic state. Motorcycles doing their best to get everyone on board killed. Taxi’s looking for a Guinness World Record for overloading at every stop. Pedestrians dodging blue water trucks and speeding 4X4’s who all think they are the most important thing on the road. Police, in their white uniforms sit watching the unfolding chaos. Japanese Peonies, taken from an arrangement given to us by the school kids in Yokohama. I didn’t know where the painting was going and tried not to over think it, but rather let it take its own course. I ended up simplifying the composition as the foliage was distracting. Also ended up adding more negative space on the right hand side of the composition for balance. There has been sporadic small arms fire some way from the house, so no worries. Still seems a tad strange to be painting flowers with an ear tuned to the radio in case there are any security updates. I have a bunch of people out at churches so need to pay more attention than I normally would have. The crows are playing a drumbeat in the curved metal roof of the house. They haven’t figured out that they cannot stand on the slippery curved metal, so land and slide scrabbling for purchase against the pull of gravity. Noisy, if funny. Lots of thunder about after last nights lightning. No rain. Martyrs Day, and cool enough to sit working on the patio, to the sound of red bishop birds going nuts in the bushes. Very special. 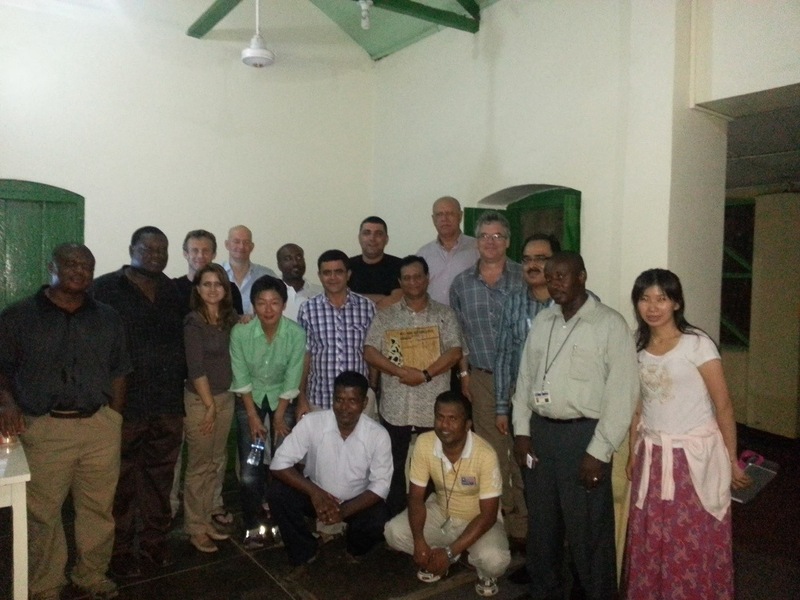 The Project Managers organised a farewell dinner at Transit Guest house, which had its origins in Somalia. Tasty, without being fiery. Various types of chicken, a lamb dish that looked a tad scary and a tomato/cabbage salad. On my jog, muddy after the rain, I passed a clump of purple wild flowers amongst the green. Stopping to take a photo to use for a painting I spotted a coucal in the bushes! My painting doesn’t have a focal point, which I may need to fix. Will glare at it for a bit and then see. Long days, and early mornings have left me a tad short of humour. The sound coming from the back wheel of the car didn’t sound right, which on stopping proved to be a ginormous nail. Fortunately the closest garage had a tyre repair facility, with a scary jack and a guy who did all the hard work of changing and repairing the puncture. Total cost, $5.00 with a tip. Going to check the outrageous invoices we are getting for repairs! 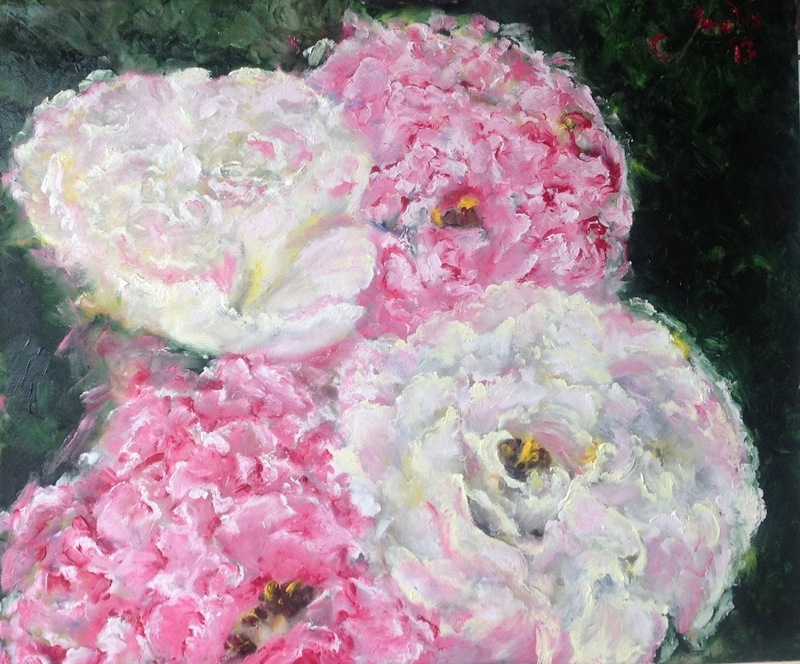 Japanese Peonies, taken from an arrangement given to us by the school kids in Yokohama. I didn’t know where the painting was going and tried not to over think the painting, rather letting it take its own course. The abstract start of the painting was interesting. 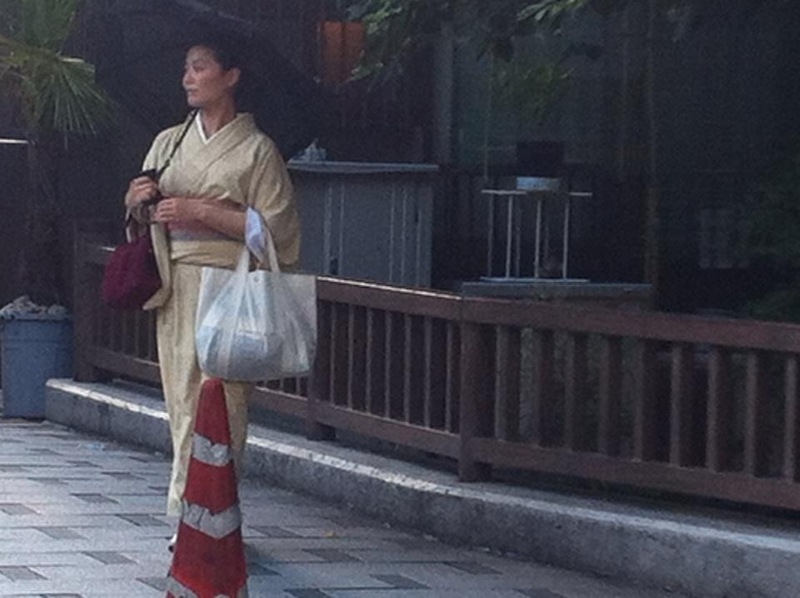 Ladies in kimonos are, as promised in the guide books, seen on the streets of Kyoto. The walk along the street leading to the famous area of Kiyamachi Dori Street, special. 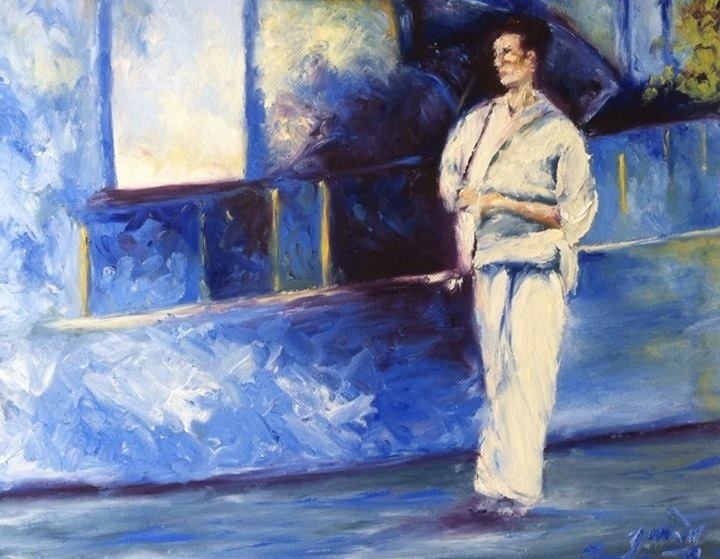 The Ultramarine and Phathlo Blue mixture, with Naples Yellow providing the basis for the painting. The office committee did a huge job of organizing the Independence anniversary celebrations for the office. A couple of kids groups did a bunch of traditional dances and then we had Juba Rock. High volume, that pushes the lousy quality speakers into overload is a must, and the singer does some sort of karaoke voice over type thing. The moves seem to be the key part, but not actually knowing who the original artist is I have no idea if it’s good or bad. They do actually sing, but the recording is so loud it’s almost impossible to know if the singing is for the timing of the dance routine, or the voice. Grilled chicken dinner with a green veg thing that reminded me of boiled rocket and wine they bought especially for me. Late Harvest!!! The celebration cake was quite spectacular. The drive back in Friday evening traffic was a tad stressful. Lots of dark people, shadows flicking through the headlights from every direction. Motorcycles and taxis made me feel like I was in a pinball machine and then there were the trucks full of soldiers driving down the centre of the road celebrating. As the thunderstorm moved across Juba 3, it left behind a zillion frogs doing the Juba rock version of Paul McCartney’s, Rupert and the frog song. An unusual bit of craziness, dealing with a Nile crocodile that decided the flooding river was less appealing than our construction camp (About a Km from the river). The workers less than thrilled with the visitor. The issue: are they protected and how does this comply with our environmental plan? Huge fight with my painting of a young girl from the traditional dancers, celebrating the anniversary of the Independence of South Sudan. Out of sorts, and certainly not the vibrancy and vitality I was searching for. I did manage to finish signing the gazillion pages of contracts while watching the mountain stages of the Tour. Not my best drive across town, with security points at most of the intersections. There is a decided feeling of edginess at the moment. In Upper Nile there are reports of Rebel Groups moving down from Sudan and in Unity the Governor has been replaced. There are also reports that the two ethnic groups in Jongelei are heading for another major confrontation. The one last year killed hundreds of people, and although it doesn’t pose any risk for my staff, it’s still a concern. The Anniversary celebrations passed peacefully, with the only drama caused by my slipping on the wet bathroom floor and bruising my bum. Really stupid and I’m lucky I didn’t do any serious damage. Finished a painting of a woman in her kimono on the streets of Kyoto. A special catch-up with Angela, here from Oxford for a few weeks. Not often that Juba is on anyone’s circuit! 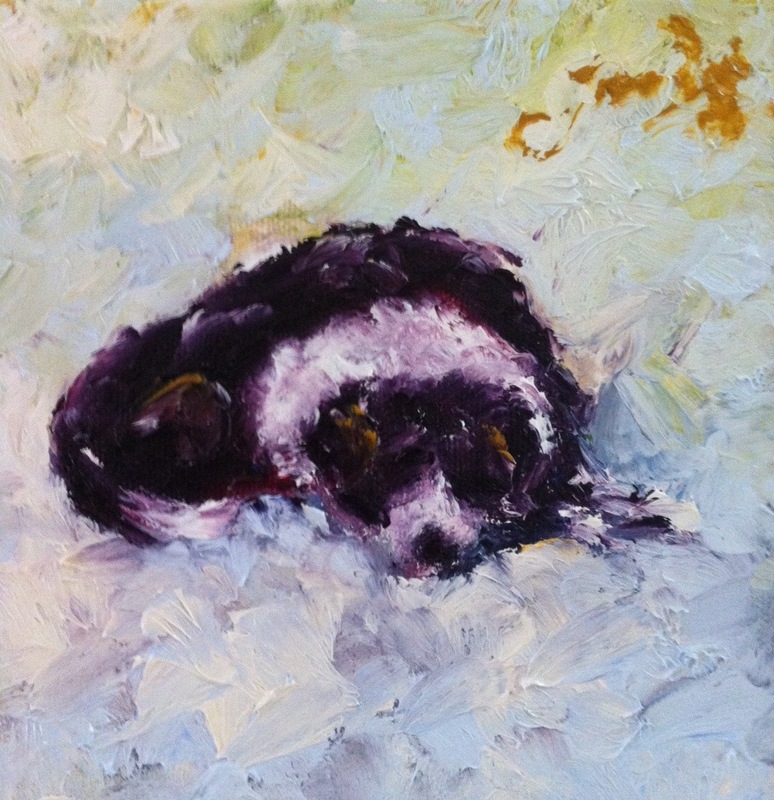 Finally sorted the small painting of Polly that I have been meaning to get done for ages. It’s not a dramatic picture but does show her in a typical, I’m not letting you get away, sort of mood. Juba 3, overcast and so quiet you don’t want to breathe in case the air you expel disturbs the tranquility. Massive thunderstorm, with lightning crashing into the building next to where we were sitting. The only casualty, my towel as I obviously didn’t wash all the red mud from the bottom of my legs that had accumulated during my jog. Did two circuits to get my long run in. A bunch of issues to juggle, some routine, and others more problematic. We had a child drown in Maban in an excavation we had enlarged for road building material. Should have done more in anticipation, particularly with the refugees who aren’t familiar with the risks. ‘The Reader’, portrait of an old man on a Sunday afternoon in Tokyo. 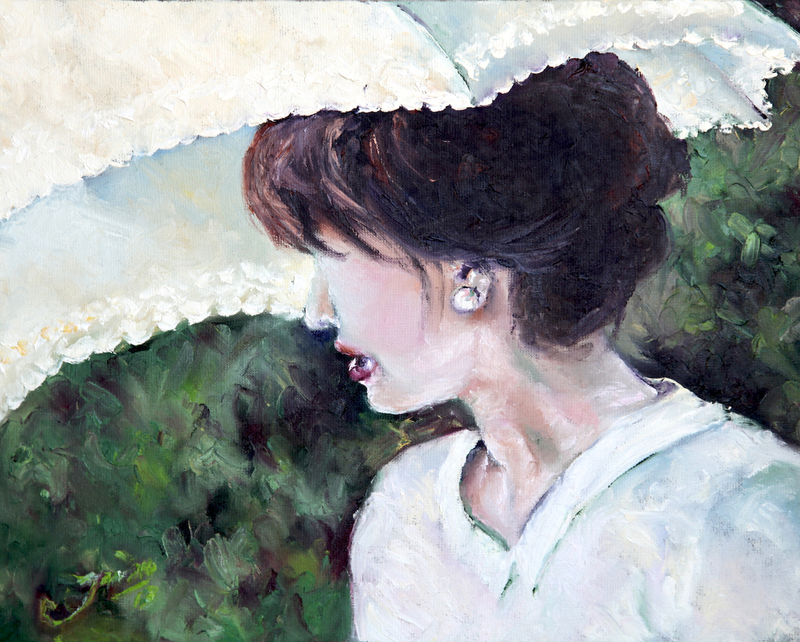 After listening to a discussion on portrait painting, I used oxide green (rather than blue) for the shadows, which opened new colour choices .Especially appropriate for the pale Japanese complexion. Driving across town on my way to the office, there was a huge storm on the horizon, with lightning replacing the sunrise. Its arrival in Juba Town drove every mozzie in the world into my office! The design concepts for the National Archives in Juba Town are in, with a few amazing approaches. The central point of the tree under which the elders meet featured prominently in many of them, as well as its unifying role in the countries identity. Presentations to the Council of Ministers will be the decider and then I hope we can actually build the thing! During my evening jog, I heard a coucal calling. Probably the black coucal. Special. It certainly must have known something, as its pouring. 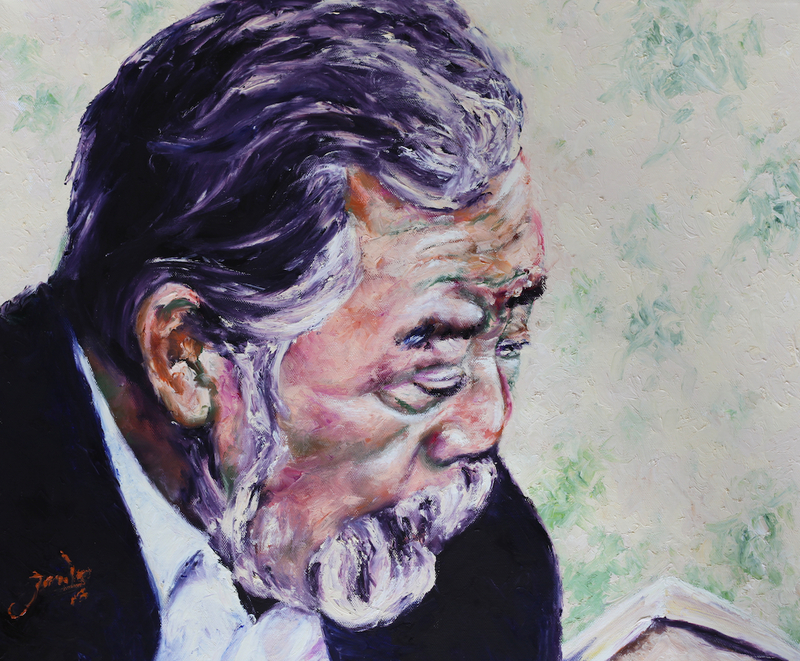 After a discussion on portrait painting, I used Green Oxide for the shadows, rather than the blue I would have normally used. It opened a range of other colours which worked well with the pale complexion of the Japanese. Sankeien gardens in Yokohama, Japan, a women sits gazing at the irises in the pond. The shinkansen (bullet train) whizzed us across from Yokohama, although no one told us that there isn’t any space for luggage, which you need to tuck under your legs somewhere. Very polite assistants offer ice cream, including the green tea option, which you have to judge carefully to make sure it’s eaten and the rubbish deposed of before you exit the train during its two second station stop. Yakisoba noodles, tempura bits and a spicy beef onion dish in the Nishiki market. The place chosen for its cold beer advert, which after five hours of shrine stomping was a priority. Fortunately they brought Terry’s LV bag we left behind to us, and Terry found the 5,000 Yen note that I dropped on my way out. The golden temple (Kinkakuji) was regal, its pond setting majestic. A bit ‘over the top’ sort of ostentatious, as apposed to the beautiful water lilies, bridges and pagoda at the Ryoanji Temple. Renowned for its stone garden, its a world of wonder. Dragons on screens, waiting to be woken. Gold fish shimmering in a patch of sunlight slanting through the delicate maple leaves, and water lilies inspiring Monet paintings. We have found the secret to choosing the local supermarket. Find the spot that has a zillion bicycles outside, with their very own policeman to direct the flow. If you can get past the scary little old ladies who will kill you in a heartbeat if you are in their way, there is an Aladdin’s cave of options. Salmon and tuna sashimi, as well as prawn tempura, was where we stopped for our dinner. Ladies in kimonos are, as promised in the guide books, seen on the streets, and although the drink looking over the river Kamo can be skipped (Supposedly one of the unforgettable things in Kayoto) the walk along the street leading to the famous area of Kiyamachi Dori Street is special. Heian Jingu Shrine, are “Vermillion lacquered buildings that flourish from season to season”. A complex of buildings, surrounded by gardens and ponds with irises and water lilies creating multiple reflections. The pathways are swept in a herringbone pattern and at each turning there is another view through to a stone lantern, maple tree or building. A covered wooden bridge crosses the main pond, which has islands strategically positioned to give scale to the view. Amazing and well worth getting lost for. I missed the stop and we needed an additional 20 minute walk. In vain, we searched for the fabled roaring dragons of Kayoto. A taxi ride across to one of the five great Zen temples in Kyoto, Shokoku-Ji, where the dragon has its lair, came to nothing. The building is closed for renovations, leaving us stranded with only a bad poster rendition of the dragon. Lunch alongside a pretty stream, some consolation. Senses reel. Ears assaulted by amplified, sing-song advertising. Eyes dazzled by neon signs, primary colour advertising, walking stick handles in sparkling crystals supporting bowed over ancients. Incense, jasmine and even cleanliness, the smell of Tokyo. Have to love the spectacle ‘cleaning bath’ outside the optometrist! Extra special after Juba dust. Our Japanese secret weapon, Chiba, was waiting when we came through customs at the airport. Her flight was late, and ours was early and so we didn’t even need to think as she negotiated the trains that lead us across the city to our hotel. 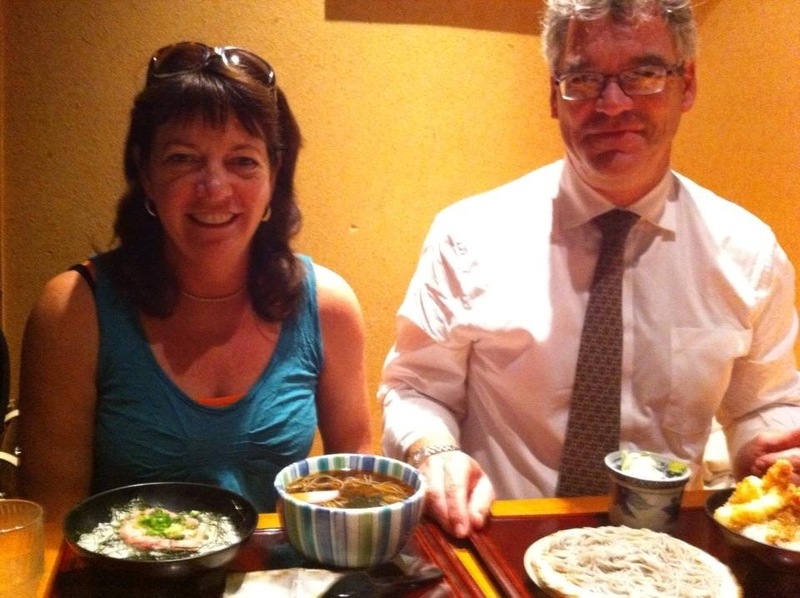 She then took us to a local Japanese restaurant, Takewaka, Spice 2 building, in Ikebukuro, where we had an amazing meal of sushi, seaweed, tempura veggies and a fried chicken dish. 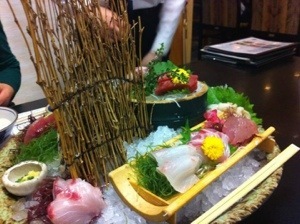 The food was presented like a small Japanese garden and tasted incredible. From a root-type thing, our attentive waitress made us fresh wasabi, which doesn’t taste anything like the tube stuff. It’s still green, but rather than a uniform grunge colour, its a host of rich green, flecked with brown. The taste, as complex. The restaurant has a large central pond full of the fish (Bonita that is only available in May) that we ate, and tables that looked to be inches from the ground, which did have me wondering how I was going to manage. However, under the table was a drop down section for those of us who can’t mange the upright, legs folded beneath them, position with which Japanese seem to be born. Excellent. A group of ultra happy people waved us into their Buddhist temple, where we were guided through the basic prayer. My Japanese wasn’t good enough to enquire about the Zen of Air Travel and Chocolate. Amongst the bustle of this part of Tokyo, we found the tranquility of the Kishimojindo temple and its magnificent Ginko tree. A must visit for every traveling leprechaun. Pink azaleas are still flowering, and the maple trees are showing off their maroon leaves. An exhibition of bonsai rhododendron trees. Every branch, a masterpiece. Every flower perfect. Too perfect? For lunch, procchutto and tomato with anchovy sauce at a Spanish restaurant. Not at all Japanese, but it was the only place that didn’t have a queue a mile long outside. They also had draft beer, which after five hours of walking seemed important. This jet lag stuff doesn’t make for easy days of concentration. Although, leaving my business cards behind can’t be blamed for that! Fortunately, the efficient system, facilitated by Chiba, ensured that I had cards for the meeting whirlwind. More difficult than I expected, with a host of issues to be resolved. White shirt; chopsticks; noodles (called Ramen, with Ikebukuro a leading battleground, where people queue for hours for the latest taste indulgence) in broth. The Gods laugh at my coordination skills! The food hall in the depths of Seibu, a feast of wonder that rivals Harrods. We had scrumptious duck breast, some kind of dumplings filled with strange, exotic, tantalizing flavours. The white shirt, again, challenged. The National Gardens are beautiful. A haven of calm after the continual senses assault of the city. We ordered our meal from a vending machine, matching the pictures and numbers. Maple trees like spun silk, with delicate leaves creating a shimmer of etherial maroon. Colour, texture and form in perfect harmony. Walking around the gardens, I have total camera inadequacy. A bit like taking wet toilet paper to a gun fight. These guys are serious! I did get my ‘camera kick’ at Yodobashi, settling for a light stand weight, knowing that I have a serious camera I have yet to master. A dozen pictures waiting to be painted. Being lost in the Tokyo metro is a sort of right-of-passage, and although we were actually where we needed to be, if not quite where we expected. I did manage to go the wrong way through the turn style, which raised the alarm and a few million Japanese eyebrows! We were made to feel like kings at the school in Yokohama, were we talked about the contrast between a school student in Japan, and one in South Sudan. Chiba did a sensational job of connecting with the kids, with interactive questions and sitting at their level doing the translation of my bumbling. Quite humbling, for me, it was. There was a reporter from the second largest Japanese news paper to give us coverage. Stunning origami garlands, bouquets of flowers and a song from the kids. The lecture at Tokyo University was over too soon. The expertise of the professors infectious. Delightful dinner (French cuisine that was a haven after the days of demanding taste sensations) with conversation filled with experience and knowledge. An amazing privilege. Sleep still a mess with jet lag creating its own schedule. Up early to get to the fresh market that was colorful and organized. None of the chaos, or colour, of the Dar fish market. We watched the fruit auction, which could have been part of a stage show it was so animated. Dodging the motorized buggies, amongst the frenetic pace, is a skill swiftly mastered. Old men, a steaming kettle between them, their day finished before most of the city has even realized its a new day. An amazing meal of sushi, seaweed, tempura veggies and a fried chicken dish. The food was presented like a small Japanese garden and tasted incredible. From a root, type thing, our attentive waitress made us fresh wasabi, which doesn’t taste anything like the tube stuff. It’s still green, but rather than a uniform grunge colour, its a host of rich green, flecked with brown. The taste, as complex. The restaurant has a large central pond full of the fish that we ate, and tables that looked to be inches from the ground, which did have me wondering how I was going to manage. However, under the table was a drop down section for those of us who can’t mange the upright, legs folded beneath them, position with which Japanese seem to be born.